UGG, the poorly named Australian shoe brand synonymous in the U.S. with the fuzzy boots that teen girls wear even when it's hot as balls outside, has made a bid to increase its male market presence in America with a commercial (by M&C Saatchi in Los Angeles) starring New England Patriots quarterback Tom Brady and the music of Mos Def (who weirdly just announced he's retiring his name). It's interestingly shot—you spend most of the time staring at Brady's feet while he goes about his daily life, and then up at him from a Steadicam that appears to be attached at crotch level. 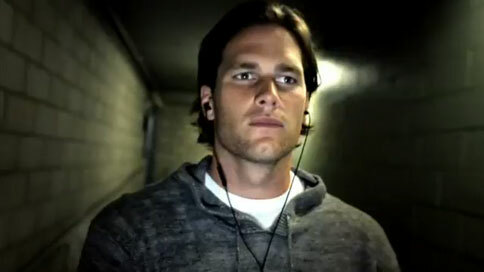 At the end, he removes his earbuds, which I can only assume are blasting Mos Def, and stares soulfully into the camera, nodding slowly, off beat, as if to say, "Yes, I am Tom Brady. I am in an UGG commercial. And neither of us is quite sure what just happened." Good luck, UGG. I don't know if you'll get a bigger male market share. But any teen girls who are watching Monday Night Football next week, when the 30-second version breaks, are totally going to swoon when Tom breaks out his final smolder.